Oh man. 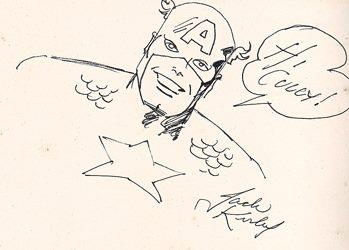 A personalized sketch of Cap from Kirby. I am jealous. I know, right? It makes me smile just to think about how over-the-moon the young Cully must have been to get that. 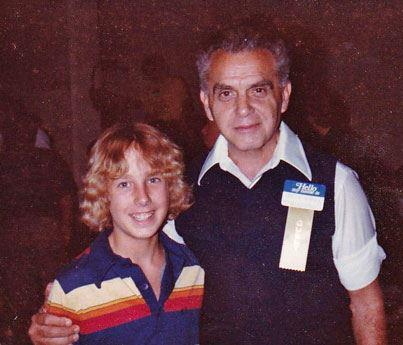 Jack Kirby and young fan Cully is the best image I’ve seen online in a long time. Makes me smile from ear to ear. THIS is what comics are really about! What a nice man Jack must’ve been. Plus the clothes -totally- authenticate it as properly period! Seriously, that is one of the nicest sets of memorabilia I have seen. Very earnest and heartfelt. I love how they made Kirby wear a guest ribbon.I guess he hadn’t reached god status yet. There needs to be a new color for the envy I feel for this guy. A photo with Kirby AND a sketch?! Wow. Kirby has a nametag- like we don’t know who he is!